INTRODUCTION: WHAT IS TENNIS ELBOW? 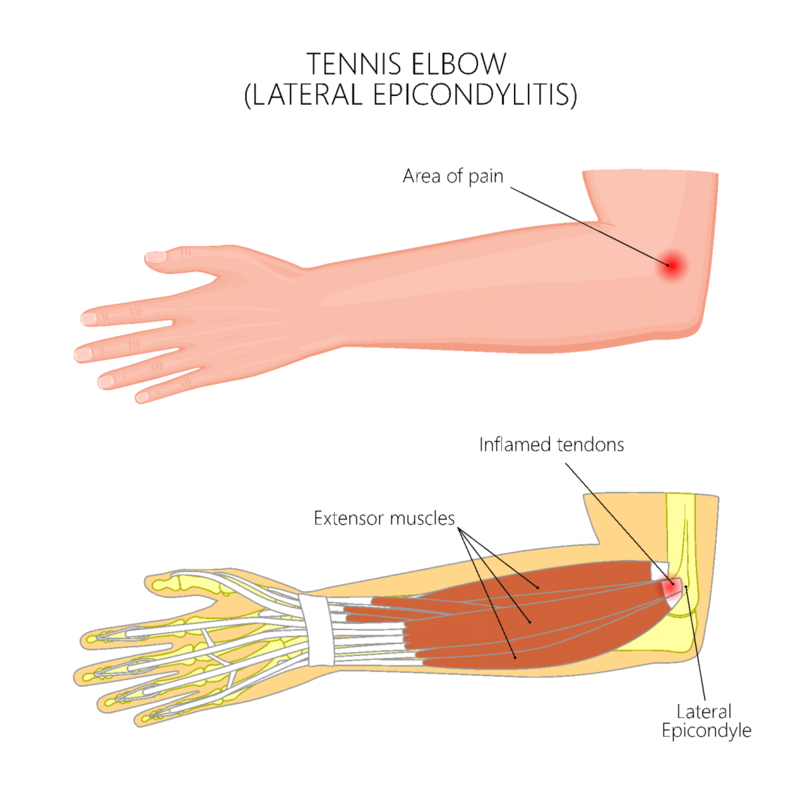 Tennis elbow, also known as ‘lateral epicondylitis’, is inflammation around the joint, resulting in pain in the outside of the elbow, particularly with movement. Tennis elbow does not just affect tennis players; it is caused by repetitive use or overuse of the extension muscles that attach around the elbow and is actually most common in women aged 40-60 years. It is similar to ‘Golfer’s elbow’, which causes similar symptoms around the inside of the elbow and is caused by repetitive use of the flexion muscles that attach around the elbow. I HAVE TENNIS ELBOW – DO I NEED SURGERY? Tennis elbow is known as a ‘self-limiting’ condition, meaning that it often resolves on its own with supportive treatment (i.e. pain relief and physiotherapy). In 90% of cases, episodes resolve within 1 year. If the symptoms are not resolved after 1 year of supportive management, further options, including surgery, can be explored. Tennis elbow can recur in 8.5% of cases; these cases are also often suitable for surgical treatment. At this stage, whilst surgery is a viable option, there are several alternatives, including continued physiotherapy, steroid injections, alternative injections (see Table 1) and acupuncture for those who wish to avoid surgery. Steroid injections are often used in managing arthritis, and can provide short-term symptom relief. However, there have been some links to an increased rate of recurrence. These contain blood products, and have been shown to be a viable alternative to surgery in tricky-to-treat tennis elbow. This will temporarily paralyse the affected muscles, followed gradual re-loading of the joint to restore function. Also used in arthritis, some early research has shown that these compounds can assist in tendon healing.